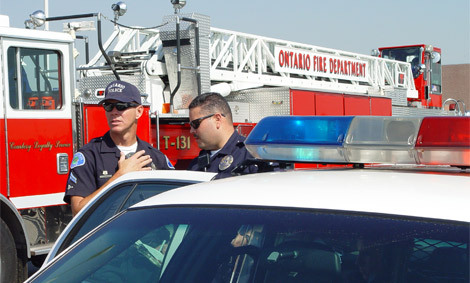 The Police and Fire Departments provide the primary safety functions in Ontario. The City is committed to protecting life, property and commerce from impacts associated with man-made and natural hazards, disasters and other threats to public safety. Natural hazards that could impact Ontario include seismic, flood, fire, and wind. Man-made hazards include hazardous materials, noise and crime. A clear management framework for emergency services for law enforcement and fire and rescue services is essential to adequately plan for and respond to these hazards. Provides policies that minimize potential dangers to residents, businesses, workers and visitors. Provides policies to reduce the level of property loss due to a potential disaster. Provides guidance on the approach to emergency management. It is the role of government to minimize exposure to natural and man-made hazards. A safe environment is necessary to build and maintain a sustainable and prosperous Ontario. Reduction in the loss of life, injury, private property damage, infrastructure damage, economic losses and social dislocation can be achieved through planning and preparedness. Interdepartmental and inter-jurisdictional coordination and collaboration are necessary to be prepared for, respond to and recover from everyday and disaster emergencies.